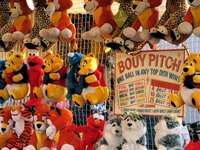 Although many festival goers participate in carnival games for the excitement of competition, game designers have carefully crafted the attractions to put players at a significant disadvantage. Some players do manage to win top prizes, of course, but many of the games employ advanced probability formulas to ensure most players walk away empty-handed. Popularized on the television game show "The Price is Right," the Plinko game starts players out with one or more hard plastic pucks and a large board with a number of pegs and numerous prize slots. The player places a single puck at the top of the game board and releases it; as the puck slides down the board, it bounces between the pegs until it finally comes to rest in one of the designated prize slots. Depending on the game and its configuration, prize slots indicate monetary or non-financial prizes, but several of the slots award no prizes at all. According to David Little, a mathematics professor at Penn State University, Plinko employs a probability principle known as a “Bernoulli trial” in which the game designer designs the board so that the puck has the highest probability of falling into the slots with no prize. To add some uncertainty to the game, the pegs represent a binomial distribution, or random variable, that introduces an element of luck that may allow the player to win a large prize. Color board games take a number of forms, but most such games start with a large surface separated into numerous colored areas. At the start of the game, players place coins, dollars or tokens on a selected square, then the game operator employs some mechanism to randomly select a winning color. Some older versions of the game employed a mouse released on a moving wheel, but animal rights concerns lead to other, more mechanized methods of color selection like a ball released on a spinning surface or, more simply, a large wheel with numerous colors that spin past an indicator. On its website for probability exercises, the Nussbaum Education Network demonstrates several color board games and notes that the probability of any color winning over any other depends on myriad variables like the number of colors, proximity of colors to one another and even the type of color board selection method. Possibly one of the simplest carnival games marketed to young children, the floating rubber ducks game features a number of rubber ducks floating along a flowing stream of water. Each duck has a prize written on the bottom, and the player simply selects a duck at random to win the prize indicated. Because carnival operators typically write very small prizes on a large number of ducks and large prizes on only very few ducks, the probability of winning a large prize is considerably smaller than the probability of winning a small prize. In addition, some unscrupulous game operators may configure all ducks to indicate small or no prizes to completely eliminate the possibility of players winning large prizes.